Worthing Football Club let a lead slip as they were dumped out of the Sussex Senior Cup last night. Goals from debutant striker Shaun Okojie and Matt Drage’s penalty sealed a 2-1 victory for Eastbourne Borough over division-lower Worthing. Substitute Jimmy Wild netted his second goal for the club 12 minutes from time and they looked on course for a surprise third-round victory. Borough had other ideas, though, and efforts from on-loan Okojie and Drage’s spot-kick saw them past Worthing. Former Worthing skipper Kane Wills started for Borough but there were no places in the squad for Lloyd Dawes and Will Hendon – who made the switch to Priory Lane in the summer – against their old club. 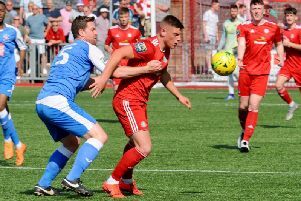 Worthing began brightly as Harvey Sparks blazed over following a slick move and forward Ben Pope failed to make the most of a fortuitous rebound. The Sports responded well and had two goals ruled out for offside. Okojie and Simon Johnson both thought they’d broken the deadlock, only for the linesman’s flag to deny them. Borough made the better start after the break. The match looked to be heading for extra-time, before Worthing took the lead 12 minutes from time. A sweeping counter-attack was finished off by substitute Wild - his second goal from the bench for Worthing - to fire them ahead. The lead lasted just three minutes as Borough were back in it. Wills came back to haunt his former side, laying on a superb pass for forward Okojie, who smashed past the onrushing Lucas Covolan in Worthing’s goal. Extra-time still looked the most likely, before Sports snatched victory minutes from the end. A moment of recklessness from Covolan would cost Worthing their place in the Sussex Senior Cup. Yemi Odubade was wiped out by Covolan, with a spot-kick awarded. Drage kept his cool and slotted his side through. Worthing welcome Tonbridge Angels in the Bostik League Premier Division on Saturday, then travel to Folkestone Invicta three days later. WORTHING: Covolan; Colbran, Young, Watson; Parsons, Budd, Starkey, Schneider, Sparks; Pamment, Pope.Subs: Mott, Rents, Minter, Hallard, Wild.